I haven’t been as active as I’d like to on my blog this year. While trying not sound like I’m making excuses, a lot.. and I mean an unacceptable amount of, I guess you could call them slight emergenices kept taking over my life. Anyway, as things calm down (knock.on.wood) and we head into the new season, I am already getting excited!! Hey, don’t give me grief about it. I believe if something excites you, celebrate it (Seriously. I may have a blog post touching on that subject, coming up). Fall excites me, Thanksgiving excites me and you know what else kind of excites me?…My childhood and all nostalgia. Anyway, I was going to do a giveaway for something “couple” related (you know, being “wifetime” and all) Perhaps even wait until the Christmas season. 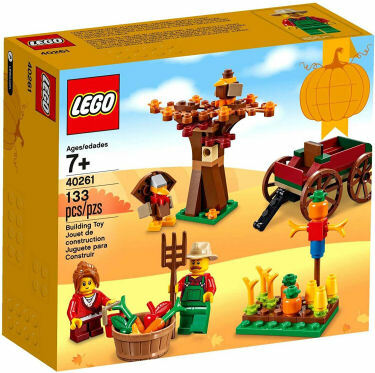 However, today while browsing online I came across a cute array of Thanksgiving Themed Lego Sets. Who in the World doesn’t love Lego? To this day I get excited for little Lego sets. And truth be told, my hubby and I do have a few 🙂 We even used to use handheld vacuum cleaners (which can be found at https://www.bissell.com/vacuums/handheld-vacuums) to clean our completed sets to keep them presentable! But of course, I was overly joyed (joyed? ha) to see a Thanksiving set. Okay look, I don’t have kids, or even have friends with kids. So if this has been around for years, please forgive my ignorance on the subject lol. There isn’t much to this giveaway. It is indeed hosted by myself and not sponsored. I just felt a little wave of wanting to say thank you to my readers, the people who help support my blog (even when nothing exciting is happening) and even to friends anew who may find something to enjoy on the Wifetime of Happiness blog. Oh here’s one more exciting piece of info.. I’ve given you many options for entering. You can do them all, or do a few; the choice is yours. BUT…Guess what Twitter folk? You can tweet 3x a day. That’s right. So mosey on back here every 4 hours and tweet again for those extra entries – Yahooo! Auto disqualification for any attempt to “cheat the system” ie) follow then unfollow, pin then unpin etc. Check out all the amazing Thanksgiving Lego Sets that amazon.com has to offer! Don’t forget your cash back from ebates.com! It’s completely free and 100% legit 🙂 If you’re not sure how ebates works, check out my post HERE. Definitely something you don’t want to miss out on!! While I love preparing holiday meals for my hubby & five sons, I never fullly appreciated how much work my Mom did to make special meals extra special until she passed & I had to continue the tradition for my own family. Three of my five boys are die-hard lego-maniacs! This is a cute set!!! I would love to win this for my grandson. Thank you. I'd love to give this to my son. He loves Legos. My son would absolutely love this. He is so in love with Legos! Is give these to my great nephew. I'm sure he loves legos… everybody does! This is so cute, would love to keep it, but would give it to my nephew. Skylar would love this set. He is a Lego kid. I would love to win this for my son! He is a huge Lego fanatic and that's all his Christmas wish list is this year. I have three boys all under 9 years-old, so I think there would be some fighting over this Lego set. We love Legos in our house! Thanks for the opportunity to win! Oh definitely.. Everyone will want to play haha! Good luck, Kate! This would definitely go to my grandson. I know the two of us will have lots of fun building together with it! I would give it to my sister's boyfriend. He is obsessed with legos. I would give this to my toddler when he's old enough to not put everything in his mouth. my son 10 and my daughter 7. we enjoy spending our Saturday mornings building legos and cooking brunch together. we have 3 sets we try to change, this would be a great addition. How nice! Good luck, Robin! I would gift this to my younger son. I have 2 little boys that would love this! I would give this to my son. He'd love this. He's all about Legos. I would love to win for my son who is 8. He just got into legos a few weeks ago with a friend and I would love to win this for him. The sets are kind of expensive for us to afford right now so winning would be awesome. Thank you for the opportunity. Good luck to everyone. You’re welcome for the chance, Renee. Happy Thanksgiving! I would give this to my nephew, he loves legos! I would give it to my 7 year old son because he still loves legos! My husband is in the military and this will be the first Thanksgiving with just us and our two girls. I'm excited to make new traditions and memories. I would give this to my daughter. She loves building and has the biggest imagination. My son would love this Him and his dad love to build legos together. How fun – Good luck!! My very first Thanksgiving as a new wife & stepmom to 3 boys was my most wonderful memory. My Grandmother, Mom & Dad were there to enjoy all the cooking & added their fond memories and stories to our feast. Great memories were made that day. Now, though all but one stepson is still here, my parents & grandparents are gone, our Thanksgiving is spent with my daughter, granddaughter, & stepson will be making memories with her Thanksgiving's. It sounds like wonderful memories, Pam.. and very busy! Thanks for sharing! I would gift this to my beautiful 7 yr old granddaughter. She has a great imagination & would probably write a story about her Lego Thanksgving. I have two little ones that would like to have this goes. My two grandchildren are the ones that would be receiving this legos set. It is very cute! I know my niece would love it! I would gift this to my daughter who is just getting into Lego's. I would give this to my middle nephew. He should have been named Zak because he's a Lego maniac! Thank you for the chance to win. I would give this to my son. We also use the holiday theme lego sets as decorations, it's great to see what he built year after year. How fun! I absolutely adore the holiday sets haha. Good luck! Id love to give this set to myself! Im a TFOL! I would give this to my boys,Christian & Camdan. My oldest son is a Lego fanatic. I would love to give this to him! There are a couple of children (and adults,LOL) that I know owuld love this and get a lot of fun out of it. My grandson and I would love to put it together! I loved Thanksgiving when I was young. We would have family over for dinner and all had a great time. I would give this Lego set to some young family members. It would be a nice surprise for them. It's something they could use every year at Thansksgiving, too. This would be for my little girl. She loves Lego sets. I know she’s enjoy the theme of this one. Yes, I would gift this to my 8 year old son!! I would give this to my Granddaughter. She loves working with Legos. The Thanksgiving memory that sticks out to me is my first with mt husband. Since his birthday is so close to Thanksgiving and Christmas, we had 3 turkeys in a very short span and all the fixings. We didn't have money for any gifts but we enjoyed the food and the memories. We try to recreated that each year. We have had a hard few years because I am terminally ill and cannot do the cooking so much but we try to do low key celebrations and hold on to our memories and the time we have left. No but there is a special big one that I want this for. These are not just for kids. My husband has a huge collection of legos and I add to them each time I can.He keeps them in his home office and they are a big part of his personality. They go with his star wars collection. The most memorable part of all of my Thanksgivings is after dinner when everyone passes out in the living room from over indulging! I love the family gathered together and sleeping peacefully! I would probably share the Lego set with my two nephews. Since one of the likes playing with Legos! I messed up on my second sentence. And I would like to rewrite it. One of my nephews does like playing with Legos! I would give it to my daughters to fight over….I mean share 🙂 They love lego building sets. It keeps them occupied for hours. Playing with lego's was always my favorite as a kid, set towns up on the stairway and our imaginations were so active then, we all had a blast, on those snowy winter days at christmas, in Michigan. Now my grandkids and I play on their steps haha! I would give this to my two grandchildren to share. For the grandkids! Neat set. I would give this to my son or one of my nephews. I would give it to my Grandkids, so we could play with it together. My birthday is on Thanksgiving when it's on a Thursday and I always tell the story of Thanksgiving when I come over. They have taken on my love for the holiday.. I love that idea, how nice! Would give this to my nephew. My best thanksgiving memory was in the mideighties the last time all of my mom's side of the family got together. I would give this to my son because he is a lego fanatic. If I win I'd blove to give it to my son. He's a huge fan of Legos. I'd give it to my kids and start a new tradition putting this together each year as a decoration! A friend of mines little boy. my favorite thanksgiving memory is when I had moved across the country away from my family; I couldn't get home to celebrate so some new friends and I decided to have our own potluck style thanksgiving. one of the best I'd ever had! I have 2 kids that love legos..a boy and a girl. I really like the wagon it looks so life like. Nice prize package. I would give it to my son, but my daughter might like it too! My daughter still loves to build these. She has a collection started now. Would love to win for my 8 yr old grandson—a whiz at LEGGOS!! I would keep it with the rest of my LEGOs for when my sister and her kids come to visit. Thank you for the chance to win! We love LEGOs! Yes, my special little one is my granddaughter. She would love to bulid with this Lego set. Our Thanksgiving memory was when my niece was born 3 months early the day before Thanksgiving. We spent the day at the hospital…she was so tiny and precious. Today she is a healthy 9 year old! We were blessed that Thanksgiving! I would give it to my daughter and son for Christmas. I will be happy to share this lego set with all of the grand kids. Can't just give to one as the others will be upset. my son is a huge lego fan, he could sit for hours just building and playing. We are expecting a new little one any day, so this will be a special Thanksgiving for us! My son is crazy about Legos, so this would be for him! My two kiddos would love this. My grandson would go bonkers for it! I would give this set to my son. He is a huge Lego fan. Oh our little one would love this! He just got into these size LEGO's and has so much fun building them. There is a little one! I'd give it to my brother – he is a Lego fanatic! 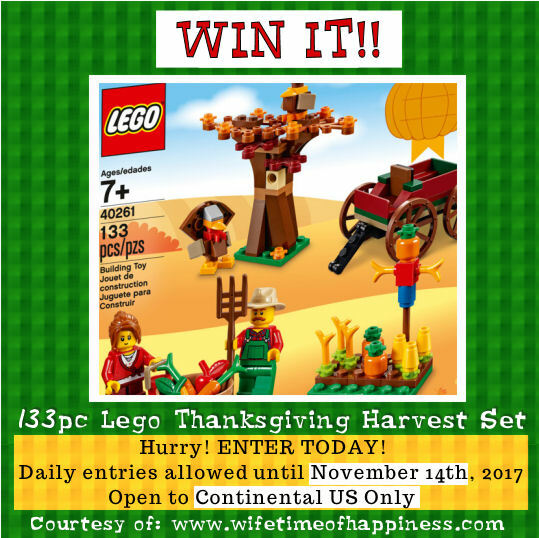 I would give the Thanksgiving Harvest Lego set to my daughter. She just loves these little Lego sets. My daughter loves LEGOs. She gets really excited whenever we get her a new set. She would love this. I love Thanksgiving and every year it's a special occasion. One of my best memories is that one thanksgiving it was the last time I saw my grandfather as he died a few weeks later. I'd give it to my niece who loves Legos. This would be fun to take to Grandma's house for Thanksgiving day where all the little one could enjoy it! I would love to give this to my 7 year old niece! My son is 19 and still collects LEGOs sets. I would give this to him. He would actually love it. My son is the leggo freak!!! but I would save it for Christmas!! Totally keeping it for myself to satisfy my inner kid! This set sounds like so much fun for my grandson. He loves Legos! Thanks for the chance. My son Kodiak would love it. Good Luck Everyone! It would be for the whole family! We would let our son and daughter build it each year at Thanksgiving. I would give this to my son! He would love this! I would love to give this to my son who is 8 and LOVES Legos! I'd love this for my sons. they are getting into building with legos now and i think they would really enjoy this set. I would love to give this to my son! He loves legos! I would keep it at my house so the grandkids and I could build together. I would give it to my grandkids to enjoy. I would give it to my kids. They love legos. I would love to have for my granddaughter her and I could have hours of fun with them! My favorite Thanksgiving memory is going to my grandmother's house and all my aunts, uncles and cousins were there along with my great grandparents. This was a long time ago! I have a special little niece that would love this! Id keep it! lol It's cute and would make cute decorations! As long as my brother does not see it..he collects Lego's! My grandson would love this! But my husband might more. I'd like to give to my nephew. This would go to my 7 year old grandson. Most of my Thanksgiving memories are of all of my loved ones in one place eating until we burst! Yes there is a special little one I would share with, but I want to keep it for myself lol!